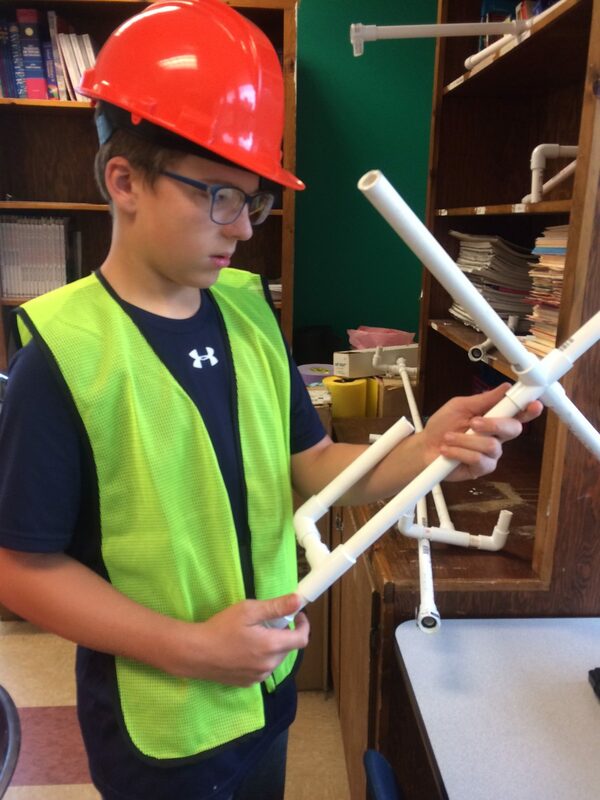 Twelve-year-old Caleb Holst ran his finger along the framework of PVC to show where he created a handle for the sprinkler he made in summer camp. Caleb Holst of Roseburg explains how he’ll use the sprinkler he built at Exploring the Trades summer camp. 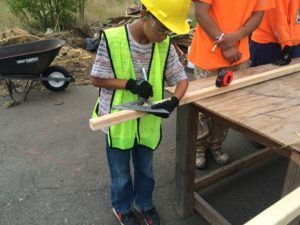 Caleb was one of about 30 middle-schoolers picking up a variety of skills at Phoenix Charter School’s Explore the Trades camp, which took place the third week in July at the school. 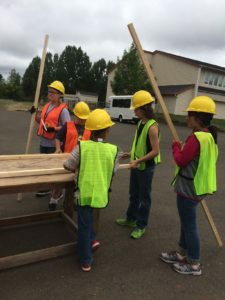 The students split into three groups and rotated between activities such as pouring concrete, building birdhouses, learning water flow theory and using a CNC printer to design emblems and decals for their hard hats. 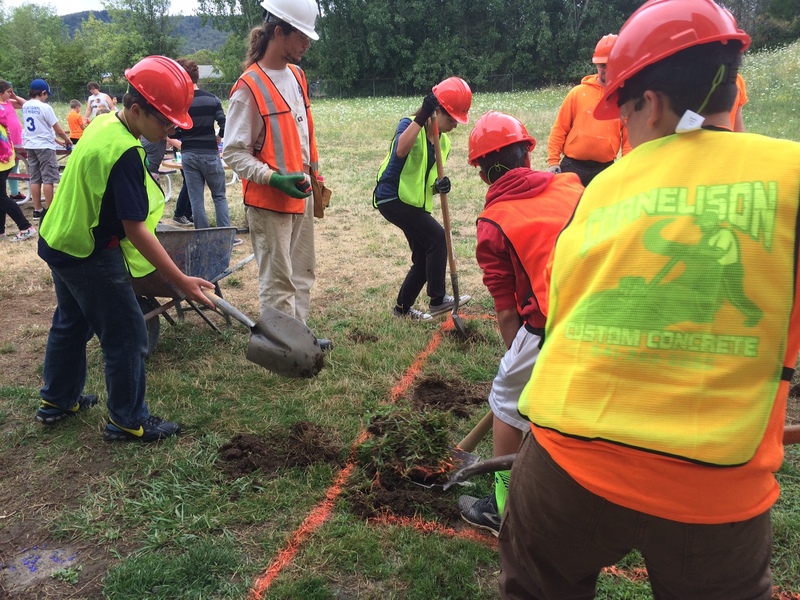 In addition to the workshops they attended at Phoenix, students were planning field trips to Umpqua Community College and the Wolf Creek Job Corps to find out more about engineering, welding and Job Corps pre-apprentice programs. Phoenix secretary Sam Batman led the workshops along with Teri Morrison, a media specialist at Winston Middle School. The two chuckled as they recounted how just the day before, kids who claimed they didn’t like math were using the Pythagorean Theory to calculate perfect right angles between a beam and a foundation. “I want kids to come away from this empowered and to realize that math isn’t so bad,” said Batman, a former heavy equipment operator. “And that trades work is a viable option for everybody.” Well, not for everybody, she soon amended, pointing out that part of what the camps are teaching are the soft skills that employers want. “It’s a viable option for qualified applicants,” she said. 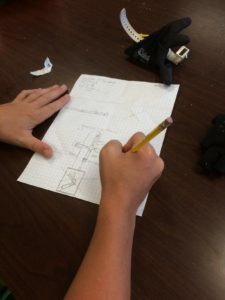 Phoenix history and social studies Instructor Jeff Lillebo said he was surprised at how enthusiastic his students were about designing sprinklers, as Caleb had done. They started out by drawing models with pencil and paper, and Lillebo assured them it was OK to find out a design was going to have to be scrapped if it didn’t translate into reality. Outdoors, one group of students used measuring tape and pencils on lumber as they prepared to operate chop saws. The wood would be used to construct 1-foot-by-1-foot forms; these would later hold concrete poured by students under the supervision of cement masonry instructor Troy Longbrake of Wolf Creek Job Corps. The result would be stepping stones students could take home for their families to admire. Meanwhile, a second group of students dug through a patch of grass in preparation for building a sidewalk adjoining two school buildings. “It’s a real-world application,” Batman explained. Former Phoenix math instructor Chelsea Ross, who will teach at the Yoncalla School District this fall, was in charge of a Discovery Learning Lab in which campers would choose a project and use provided materials to create a keepsake. 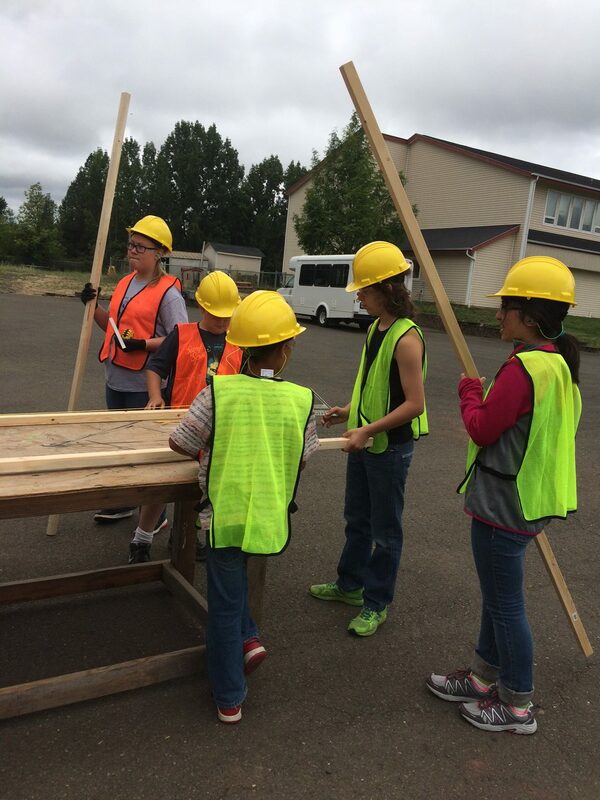 As part of the Umpqua Valley STEAM Hub’s Expanding Horizons series of summer camps, Exploring the Trades had a businesslike subtext. Safety was a priority, as was teaching skills that could one day lead to job security. But Batman didn’t want the atmosphere to be too serious.